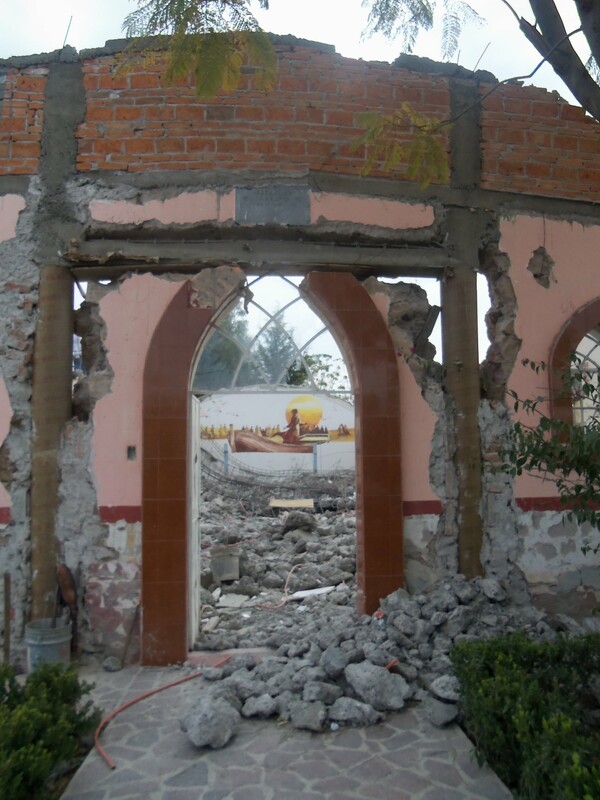 December 29 of last year, the Disciples of Christ Church in Maravillas, Mexico saw its new roof on the sanctuary collapse. 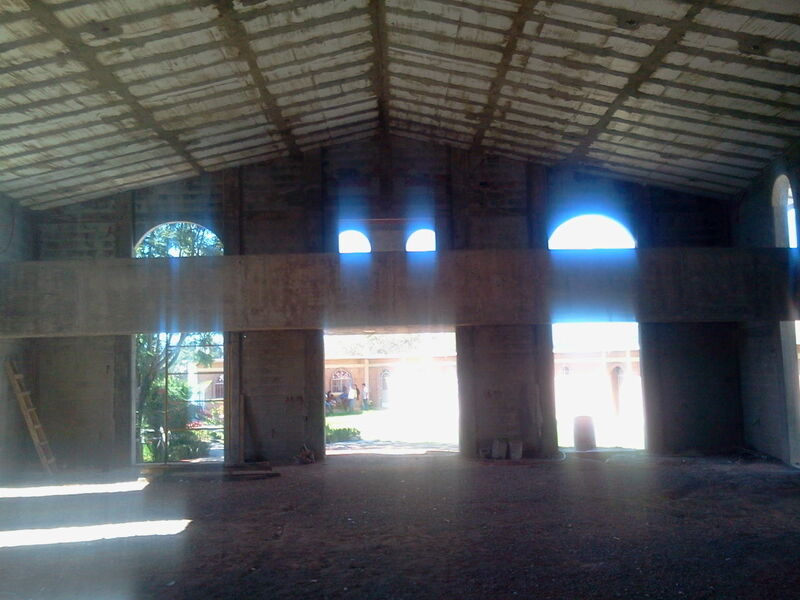 In the following interview, Maravillas member Ramiro Ortiz Pardo describes the remarkable progress made in rebuilding the sanctuary in the past year. As President of the Building Committee, Ramiro testifies about the congregation’s growth in faith as they marvel at what God and they working together have been able to accomplish. The English translation by Doug Smith precedes the original interview conducted in Spanish. For more of the Maravillas story enter Maravillas in the search engine window of “Erasing Borders” to locate the blog articles published on Feb. 13 and May 5 this year. conta la historia del progreso impresionante en la reconstruccion del templo durante el ano 2013. Como Presidente del Comite de Construccion, Ramiro da testimonio sobre el crecimiento de fe dentro los fieles de la Iglesia tanto que alaban a Dios por lo que Dios y la congregacion trabajando conjuntos han podido lograr. La traduccion en ingles de Doug Smith se sigue con el espanol de la entrevista originale. Para leer mas sobre lo que ha succedido en Maravillas el ano pasado pase a la ventana de Busqueda (“Go”) de este blog para marcar” Maravillas” y hallar dos articulos del 13 de Febrero and 5 de Mayo. this project. It’s a sign that God has been with us even with the loss of the sanctuary, even when the roof fell in. Always with us up to this moment. It’s like a testimony before the whole community that we in this church believe in a powerful God that has been able to help us go forward in spite of our loss. And it’s a testimony for all those churches that have helped us with their shared offerings, a testimony that we are strong in the faith with their help. With the help we have received how could we get discouraged? We have shown that we are strong in our faith, stronger in reality than we were a year ago, stronger in every way, even in our daily lives, since we now have a charge, a work to carry out for the honor and glory of God. So, finally, the work has become a testimony that we are not alone. Tell us more about the financial support the Church has received for the construction project. wanted to go ahead without depending on other churches. If they helped, thank you and may God truly pay them for it but we weren’t going to cross our arms and wait until they sent us financial help. 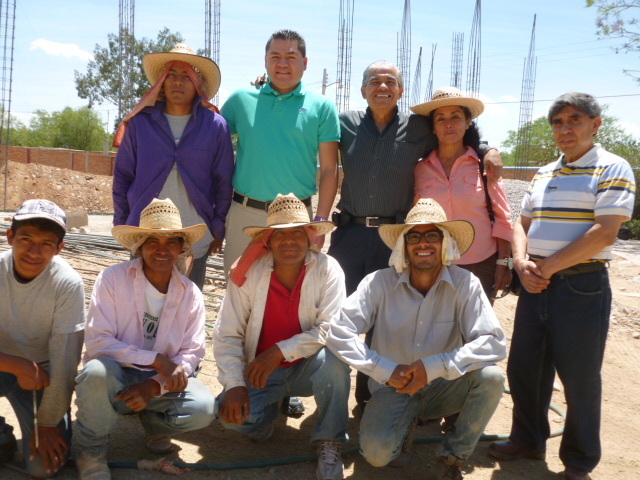 We’ve received help from various churches of the Cofraternity (Disciples of Christ in Mexico) and from churches in the U.S. We also received a grant from the current administration of Maravillas township for the construction of the roof. Their donation amounted to 50,000 pesos (around $4000). I visited with the mayor and within a month his administration helped out. described how God knows whom to give to and whom to bless abundantly. If God gives a lot to someone who doesn’t know how to manage what they have that person is going to spend purely on material things. This sister told me that God had given me resources to manage for Him and for that reason I need to seek for ways to do just that. God knows to whom money should be given. Here on earth I consider myself one of God’s treasurers. All that God has chosen to give me carries for me the message that I am to watch over it, take care of it, manage it for Him. I don’t feel that I own it because in reality it isn’t mine, it belongs to God. Therefore I have to give, I have to put it to work as my sister in Christ advised me. But I also believe that we all have the opportunity to be blessed by our giving even though we don’t have much money. I don’t give with an eye on how much you are giving to give. It’s true that I have felt joy in giving. It’s like when one gives to another person 10,000 pesos and that person feels happy, it’s the same happiness that I should feel in giving this amount to help out. I am happy when I can give to someone who needs help. 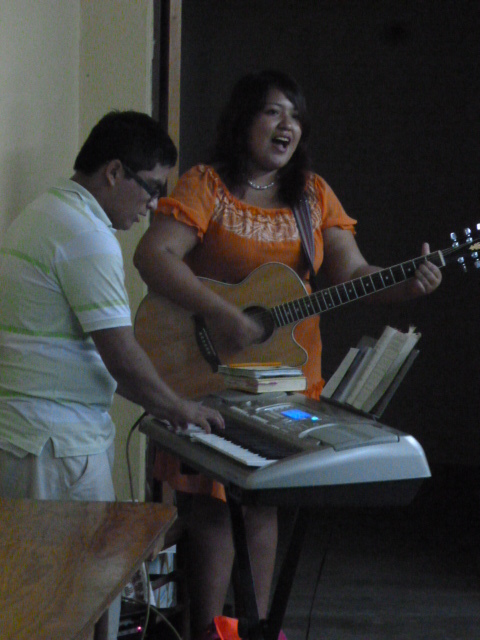 I tell myself that this is my opportunity to show that God is truly in my heart. There have been times when I wanted to give a testimony about how God has blessed me in many ways through my giving. But I don’t do it because there are others who give testimony about how they give so much and God has returned double the amount to them or how they received a good job after they gave or how with the money received after they gave they were able to buy a machine for their factory. I don’t want to speak about giving in that way because people could think that giving is like I’m investing and also that I’m boasting. I feel this way even though in my nine and a half years of running my company I have never failed to pay my employees on time. We’ve always been able to cover our payroll even at times when it’s been complicated by a lot of bills and unforeseen costs. What are the Church’s plans for finishing the sanctuary building? want to give a little more. If they don’t want to give they shouldn’t because that would be worse. When someone gives because they feel obligated or their heart isn’t in it that won’t really help but for those who give from the heart, may they come and do so. Then in January we will see how much our debt (now at 300,000 pesos) has been lowered or hasn’t been. But in any case we can continue putting finishing touches on the roof because not much expense is involved there. 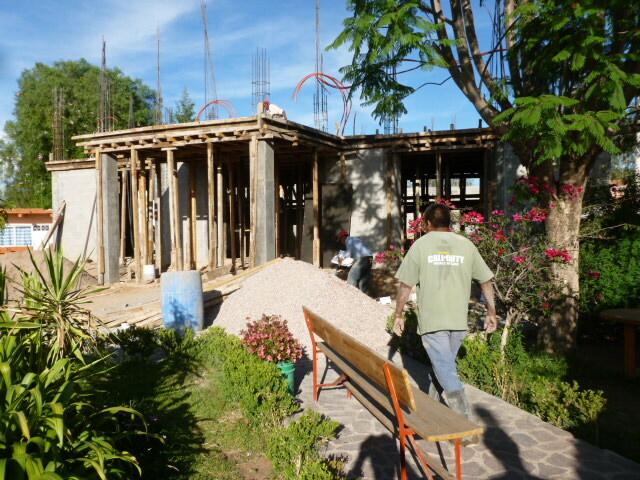 With 20,000 pesos a month we can put the finishing touches on the roof. And then we’ll proceed step by step inside and out with a window here and something else there until we spend the 300,000 pesos (around U.S. $24,000) that we estimate will be needed for the final stage of the project. That way it won’t look like we’ve abandoned the work. It’s important that we carry on and people won’t forget the need to pitch in. And with the much and the little that people are able to give and the help we receive from others God will enable us to finish the new sanctuary in the year to come. No one can ever say this new sanctuary is mine; no one can ever say this is mine and I’m going to sell it. At the same time I can say it’s mine, it’s ours, it belongs to us all. So we are going to pledge among ourselves that we will complete the project. The worse would be to say no we can’t go on because I’m sick or I don’t have the money. Money and the material supplies it buys aren’t everything. This sanctuary is being built with something other than money and that’s why I am sure we will finish it before the end of this year. “Estamos muy sorprendidos que en menos de un año hemos hecho esta especie de avance en la construcción. Es una señal de que Dios ha estado con nosotros en este proyecto. Es una señal de que Dios ha estado con nosotros aún con la pérdida de nuestro santuario, aun cuando el techo se derrumbó. Siempre ha estado con nosotros hasta este momento. Es un testimonio frente a toda la comunidad de que nuestra iglesia cree en un Dios poderoso que ha sido capaz de ayudarnos a seguir adelante a pesar de nuestra pérdida. Es un testimonio para todas las iglesias que nos han ayudado con sus ofrendas, es un testimonio de que somos fuertes en la fe con su ayuda. Con la ayuda que hemos recibido, ¿Cómo podríamos desalentarnos? Hemos demostrados que estamos fuertes en nuestra fe, más fuertes de lo que éramos hace un año, fortalecidos en cada aspecto, incluso en nuestro día a día, ya que ahora tenemos una encomienda, un trabajo que llevar a cabo para la honra y gloria de Dios. Finalmente, el trabajo ha sido un testimonio de que no estamos solos. responsabilidad, queríamos empezar sin depender de otras iglesias. Si ellas ayudaban, gracias y que Dios realmente les recompensara por ello pero no íbamos a cruzarnos de brazos y esperar hasta que nos mandaran apoyo monetario. Hemos recibido ayuda de varias iglesias de la Confraternidad (Discípulos de Cristo en México) y de iglesias en los Estados Unidos. También recibimos una suma de parte de la actual administración del pueblo de Maravillas para la construcción del techo. Esa donación alcanza los 50,000 pesos (alrededor de $4,000 US dolares). Yo visité al presidente dela comunidad y en un lapso de un mes su administración ayudó. Hace poco tiempo recibí un gran consejo de una hermana en la iglesia que describía cómo Dios sabe a quién dar y a quién bendecir en abundancia. Si Dios la da mucho a alguien que no sabe cómo manejarlo, esa persona va a gastarlo enteramente en cosas materiales. Esta hermana me dijo que Dios me ha dado recursos de Él para administrarlos y por esa razón necesito buscar maneras para hacerlo. Dios sabe a quién debe ser dado el dinero. Aquí en la tierra me considero uno de los tesoreros de Dios. Todo lo que Dios ha escogido darme conlleva un mensaje de que debo observarlo, cuidarlo, administrarlo para Él. No siento que me pertenezca porque realmente no es mío, le pertenece a Dios. Por esa razón yo debo dar, debo poner todo mi esfuerzo justo como la hermana en Cristo me lo aconsejó. Pero también creo que todos tenemos la oportunidad de ser bendecidos por nuestras ofrendas a pesar de que no tengamos mucho dinero. Yo no doy fijándome en lo que voy a recibir a cambio. Es verdad que he sentido gozo en dar. Es como cuando uno le da a una persona $ 10 000 pesos y esa persona se siente feliz, es la misma felicidad que yo debería sentir al ayudar con esa cantidad. Soy feliz cuando puedo ayudar a alguien en necesidad. Me digo a mí mismo que ésta es mi oportunidad de demostrar que Dios realmente está en mi corazón. Ha habido tiempos en los que he querido dar testimonio acerca de cómo Dios me ha bendecido en muchas formas a través de mis ofrendas. No lo hago porque hay otros que dan testimonio de cómo han dado tanto a Dios y han recibido el doble o han recibido un buen trabajo después de haber dado o gracias al dinero que recibieron después de haber dado pudieron comprar una máquina para su empresa. No quiero hablar acerca de dar en esa manera porque la gente podría pensar que dar es algo parecido a invertir o podrían pensar que alardeo. Me siento así a pesar de que en los 9 años y medio que he estado dirigiendo mi compañía nunca he dejado de pagarles a mis empleados a tiempo. Siempre hemos sido capaces de cubrir la nómina incluso en ocasiones complicadas por las cuentas por pagar y los costos no previstos. ¿Cuáles son los planes de la iglesia para terminar la construcción del santuario? La congregación entiende que durante el mes de diciembre la gente recibe un poco de dinero extra en sus trabajos – un aumento de salario, un préstamo, un bono, dinero adicional – Esperamos que en este mes la gente sea capaz de dar un poco extra al proyecto. No están obligados a dar más. Es sólo que con lo extra que reciben este mes ellos mismos querrán dar un poco más. Si ellos mismos no quieren dar simplemente no deberían hacerlo, eso sería peor. Cuando alguien da porque se siente obligada o su corazón simplemente no está en eso, eso no ayudará. Aquellos que sientas el deseo de hacerlo en sus corazones, adelante. En enero evaluaremos nuestra deuda (actualmente en $300 000 -ed.) y qué tanto ha disminuido o aumentado. En cualquier caso podemos continuar colocando los toques finales en el techo ya que no implica mucho gasto en esa acción. Con $20 000 pesos al mes podemos poner los toques finales en el techo. Entonces podríamos proceder paso a paso adentro y afuera con una ventana aquí y otra cosa allá hasta que gastemos los $300 000 pesos (alrededor de $24, 000 dólares) que estimamos necesitaremos para completar la etapa final del proyecto. De esta manera no parecerá que hemos abandonado el trabajo. Es importante que sigamos adelante y que la gente no olvide la necesidad que tenemos de avanzar. Y con lo mucho y lo poco que el agente sea capaz de dar y con la ayuda que recibimos de otros, Dios nos permitirá acabar su nuevo santuario en el año que viene. Nadie podrá decir nunca que este nuevo santuario es mío; nadie nunca podrá decir que es mío y que pienso venderlo. Al mismo tiempo, puedo decir que es mío, es nuestro, nos pertenece a todos. Así que vamos a pedir entre nosotros para así completar el proyecto. Lo peor sería decir que no podemos continuar por enfermedad o falta de dinero. El dinero y los recursos materiales que compra no lo son todo. Este santuario está siendo construido con algo más que dinero y esa es la razón por la que estoy seguro que terminaremos antes de que termine el próximo año. My history in the Church began at a very young age because my parents began to prepare for pastoral leadership of a church as lay pastors when I was around 5 years old. This family involvement in the Church led me to participate at a young age in the life of two congregations, the one which my parents pastored and the church where we were members. In the two churches I began to take on leadership roles with the children and youth and with children’s education programs – by necessity in the small church my parents pastored and in the other congregation with the desire to become more involved. From a young age I took classes that the adults took and completed the work assigned and fully participated in the class. So from around ten years old I was committed to serve the church and that’s the way it’s always been. So it was easy then to make your choice of vocation to serve as a pastor? No, no it was not easy in any way. My concept of being a female pastor was very limited. My concept was that of having to be a single woman as a pastor and for me at that time of my life forming a family was a top priority for my life. I did not see my mother as a pastor as my father has been and is the one officially charged with the pastoral functions where they serve. To be a pastor then meant making the sacrifice to not have one’s own family. For this reason, I preferred to see myself as well prepared to serve as a pastor’s wife with a family instead of myself serving as a pastor. On finishing high school in San Luis Potosi I decided that if I didn’t pass the exam to enter university for nursing studies then I would enter seminary. So when I passed the exam with a very good score I was elated; it was a great relief for me. But during my university studies I developed a close friendship with the missionary couple from Puerto Rico, Justino Perez and Zaida Rivera. Relating to them led me to think harder and deeper about theology and specific doctrines that I held at the time. Doctrines having to do with “this is how God speaks to us”, “this is how to be church”, “this is how not to be church”, “this is what the Bible says”, etc. Also during my university training for nursing, we went to a summer session for Latinos held at Brite Seminary in the U.S. In that environment I felt the need to think more about how I would serve the church. I can say now that I felt a call to be a pastor. I talked with Justino and Zaida and they counseled me to complete my Bachelor’s degree in nursing so I would be prepared to apply for seminary studies at the Master’s level. After graduating with the Bachelor’s, I chose the seminary in Puerto Rico mainly because that was where I knew some people, namely the two missionaries who were returning home. On their recommendation, I sent all my documents and academic records to Felix Ortiz in the Global Ministries’ Latin America office and it was a wonderful surprise for me and for Justino and Zaida to learn I would be receiving a generous scholarship in support of my pastoral studies. of Los Retes on the outskirts of SLP) are the most recent along with me. I see this as a beautiful legacy but also something that can become a burden because there are so many who have gone before who are well known by persons still active in the Church. So now what are your priorities or the outstanding priority for your work with the Roundtable of the Disciples and Congregational Churches and with the Central Christian Church here in SLP? Well, in my prayers, it comes down to continuing education and “true accompaniment”. Accompaniment in the sense of not serving in a paternalistic manner which leads the church to dependency on someone to make its decisions or approach the Biblical text or become closer to God. “Effective accompaniment” as I see it means to share our experience and help administer programs but in a way in which the church walks on its own. Involvement in all the diverse areas of church and family life, providing tools for living by the faith but never pretending that we have the final solutions this is what I mean by “effective accompaniment”. And in continuing education I plan to offer some new concepts, new ways of doing theology to lay and pastoral leaders alike; for example I intend to present the theology of liberation, awareness of community building required didn’t have and now can offer such as new versions of the Bible and capacity and resources for biblical exegesis, etc. Continuing education carries more importance in our churches because lay leaders are required to take on such an important role in forming the discourse in our congregations and in our Disciples Church as a whole. So they need support in acquiring the educational tools for this role. Many of them take on the pastoral role faced with the immediate necessity, among them, my parents. They were provided with the best education the Church had but it was not a formal seminary course of instruction. They have been trained and they have been recognized for many years for filling the role of pastor of a congregation. We now must make accessible to them new concepts and learnings in response to their needs and the role they are dedicated to filling. As a woman, as a young woman with a post graduate Master’s degree in pastoral training, don’t you feel a great challenge in beginning your work here where you are known as a daughter of the Church? “self discovery” during my seminary training. What really helped me was the recognition that I was not alone in facing the challenges and this moving away from preparing to face them in a solitary, lonely struggle helped me a great deal. There are many others with their own worries, desires and similar challenges. I began to take more notice that in Mexico while I was in seminary there were pastors and leaders of churches who were living their own processes of growth and learning. And in talking with pastors and lay leaders here I met with many who shared their desire for further training through continuing education. They spoke with me about their own efforts to approach challenging themes such as new theological concepts, traditional doctrine, how to read the Bible and how to come closer to God. So finally, this set of challenges pleases me because I don’t return to Mexico with the idea of opening doors or a door that is completely unknown. I know there are people around me and with me at those doors and that fact helps me greatly in seeing the doors and the challenges with more clarity. In a spiritual retreat in Puerto Rico, I saw the challenges from the point of view of the parable in which the kingdom of heaven is described as being like the woman taking some leaven and putting it in some dough. Seemingly nothing happens until the next morning when on awakening the woman sees the dough has been leavened. Thinking about this woman, I began to consider my task in seminary as gaining some leavening of real quality. I now want to share this leavening, I want to teach things that are meaningful and important today, I want to share quality experiences that effectively leaven the dough. Where do you see real progress with the churches in Mexico today? Where is there a breaking in of a vision of the kingdom of God in the life of the churches? Well, I see an intergenerational opening in the churches today. One generation is open to listening and entering into dialog with another. I have seen some beautiful examples of change, of progress, of improvement when the youth become aware that they have a voice, they have ideas, they have something to offer and the adults are responding, “I want to listen and I am ready to work with you”. When I’ve visited congregations where this kind of dialog is happening and not only dialog, but accompaniment also, and where the youth feel appreciated and backed by the adults and where the adults do not feel intimidated or threatened by the youth, in those congregations new opportunities flourish and the church is in movement. When the generations really listen to each other, the structures of the church become less important than the people in the church. So Lisania, is there any other area in the church life today where you feel called to add your leavening? Yes, I am interested in being involved in the opportunities of continuing education. 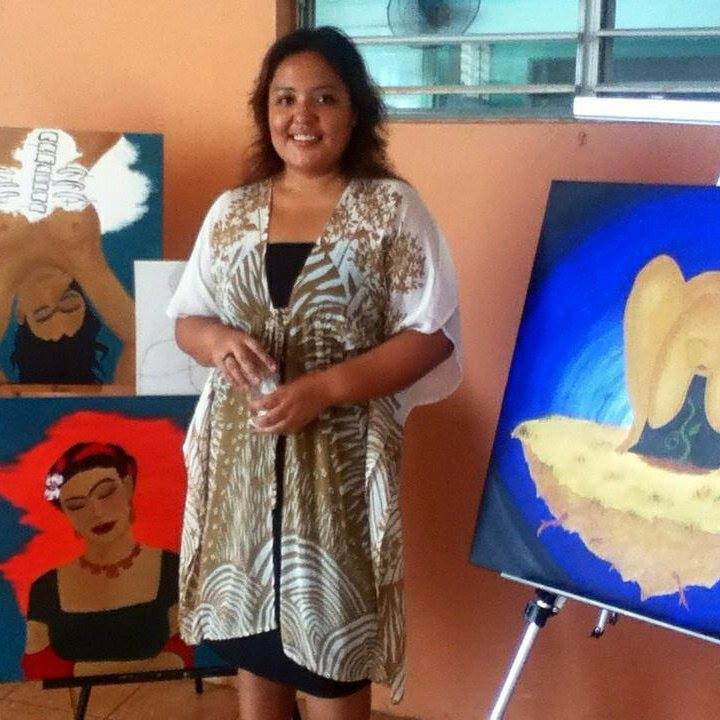 I am interested in sharing what I have learned and am in the process of learning and I am interested in providing opportunities for women who face the consequences of machismo in the Mexican culture and the rigid gender roles that are so strong here. I want them to come to know and understand the way in which the Bible has often been used to support these conditions for women and men. I feel strongly the need to offer opportunities to study and discuss the way in which we can prevent the Bible from being used to maintain oppressive structures. 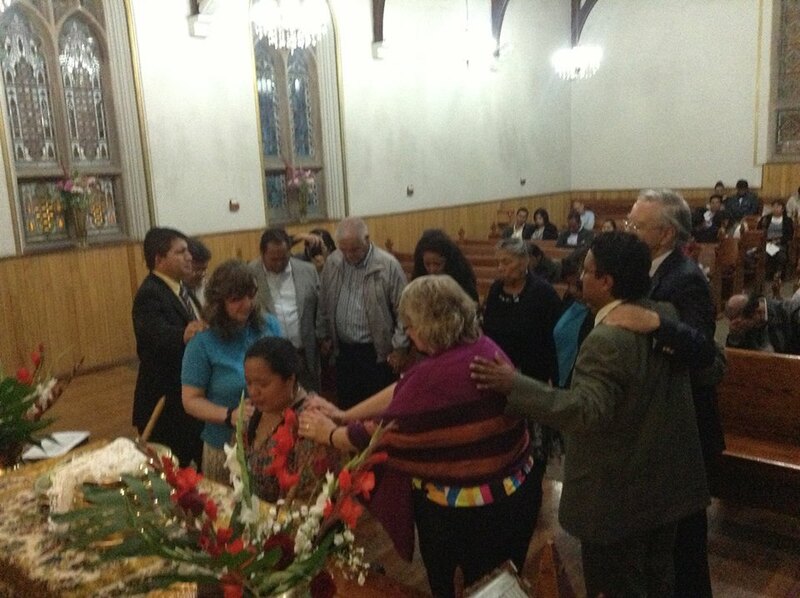 Right now, there are only three ordained female pastors un Mexico un Disciples of Christ. But a lot of women are working, more than we three. I know de can change that reality. Finally, I don’t see this context of machismo as healthy or pleasant for men either. I see that machismo damages both men and women. Men must get tired out from having to be right all the time, from having to be in control all the time and not having the right to express their fragility or the fact that they are tired. Machismo it seems to me is extremely oppressive and damaging for men as well. La Revda. Lisania Sustaita Martinez fue ordenado en la Iglesia Central de San Luis Potosi el 17 de noviembre. Ella es la primera pastora o pastor de los Discipulos en Mexico de haber sido formado a los niveles de licenciatura y la de maestria. Sus estudios en el Seminario Evangelico de Puerto Rico como candidata para el nivel de M.Div. fueron apoyados por una beca otorgada por la oficina de America Latina del departamento de Ministerios Globales de los Discipulos y la U.C.C. Yo creo que mi historia en la Iglesia empieza desde muy pequeña porque mis papas comenzaron a prepararse para atender una iglesia como obreros laicos desde que tenia como cinco años de edad. Esta cercanía me involucró desde una corta edad en la vida de dos Iglesias, la Iglesia que mis papas pastoreaban y la Iglesia a que pertenecíamos. En las dos Iglesias comencé a involucrarme en el liderazgo de la juvenil y con la educación de la niñez; en la Iglesia de mis papas con pocos miembros, por la necesidad de quien se involucrara en el trabajo y por la otra iglesia, por deseo de involucrarme más. Desde muy joven tomaba las clases que los adultos tomaban y me dejaban presentar tareas y participar; me permitieron a participar y estudiar con ellos y con esto creo que desde los diez años estaba comprometida con el servicio de Dios y así fue siempre. Trabajé en el liderazgo sobre todo con la niñez y con la juventud. Fue fácil su decisión vocacional de servir como pastora entonces? No, no fue fácil en ninguna manera. Mi concepto de pastora fue limitada. Mi concepto de pastoral femenina era de ser soltera y en esa época para mí, formar una familia era un deseo prioritario. 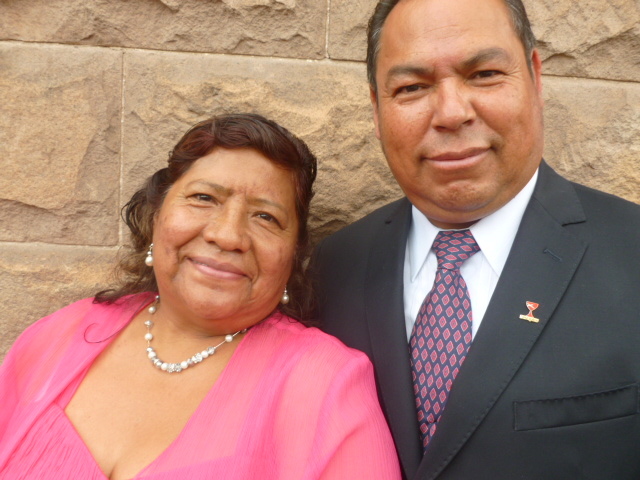 No veía a mi mamá como pastora por que mi papá es el encargado oficial de las funciones pastorales en la Iglesia. Ser pastora para mi llevaba el sentido de hacer el sacrificio de no formar una familia propia. Por esos conceptos, prefería verme como preparada para ser esposa de pastor y con familia, en lugar de servir yo misma como pastora. fue muy nutritiva para mi por las ideas que me plantean en cuanto a las perspectivas y las doctrinas específicas que yo tenía. Como “así habla Dios”, “esto es iglesia”, “esto no es iglesia” “esta es lo que proclama la Biblia”, etc. También al medio de mis estudios fuimos a un curso de verano para latinos en el seminario de Brite en los EUA. En esa ambiente me sentí en necesidad de enfocarme en el servicio de la Iglesia. Lo que puedo llamar vocación pastoral. Hablé con Justino y Zaida, quienes me aconsejaron terminar con la Universidad para que así pudiera aplicar en un seminario a nivel maestría. Escogí el seminario en Puerto Rico sobre todo por que ellos son de allá y en otros lugares con seminario no conocía a nadie. Presenté todos mis documentos y mis planes a Felix Ortiz de Ministerios Globales y fue una agradable sorpresa para mí, para Justino y Zaida que recibiera una beca generosa para apoyar mis estudios pastorales. Entonces cumpliste tus estudios en junio de este año y volviste a Mexico para ser ordenada por la Iglesia Discípulos y servir a esta iglesia como 18 otros de su familia han servido. Si es cierto que en la familias Martinez y Rosas (familia por parte de mamá) hay 18 otros que han servido y sirven como pastores. Mis primos Josué Martínez y David Flores son los más recientes y después yo. Creo que este es un bello legado pero también podría resultar una carga por que hay tantos antes de ti que son reconocidos de la gente aun en vida. Y tus prioridades o la prioridad sobresaliente por tu trabajo con la Mesa Conjunta de los Discípulos y los Congregacionales y con la Iglesia Central de San Luis Potosí? Bueno, en una oración, la educación continua y acompañamiento efectivo. Acompañamiento en el sentido de no servir en una manera paternalista que la iglesia no dependa absolutamente para hacer sus decisiones o acercarse al texto bíblico o para su experiencia con Dios. El acompañamiento es compartir nuestra experiencia y administrar programas pero de un modo en el que la iglesia camina sola. Asumir las diversas áreas de la vida de la congregacion, de las familias, proveyendo herramientas para vivir en la fe, pero nunca presumiendo que tenemos las soluciones definitivas. Y en la educación continua, también otorgando nuevos conceptos nuevas maneras de hacer teología a los lideres laicos como por ejemplo proponiendo la teología de liberación, consciencia de labor social que se requiere de la iglesia; avances, descubrimientos que antes no teníamos y ahora podemos conocer como nuevas versiones de la Biblia, incursión en la exégesis bíblica, etc. La educación continua lleva aun mas importancia dentro de nuestras Iglesias por que los laicos asumen un papel sobresaliente formando el discurso dentro de nuestras Iglesias y la Iglesia Discípulos en México, requiere que la pastoral sea respaldada con herramientas educativas. Muchos de ellos y ellas, laicos que se lanzan a pastorear ante la inminente necesidad; entre ellos, mis padres. Hubo la mejor educación que se les pudo otorgar, pero no educación académica formal en seminario. Han sido capacitados como líderes u obreros laicos y son reconocidos como pastores por sus muchos años y porque la labor que han realizado es propiamente la de pastorear una congregación. Tenemos que hacer accesibles, conceptos y enseñanzas actualizadas a este cuerpo pastoral y líderes laicos, en respuesta a la labor y esfuerzo que vienen realizando. Como mujer, como joven con una formación de posgrado tras la licenciatura, no te sientes muy desafiada empezando tu trabajo aquí en donde te conocen como hija de la Iglesia? Si, me siento muy desafiada, pero de manera positiva. En el pasado pude sentirme desafiada como una carga agresiva, dadas las expectativas propias y ajenas sobre mí; pero he estado trabajando con estos desafíos en Puerto Rico en mi proceso de auto-descubrimiento durante los estudios. Aprendí que se tiene que aceptar y tomar conciencia de las altas expectativas propias y de la gente que te rodean, por los logros que ya has alcanzado o los legados que llevamos detrás. Es entonces que puedo pasar al sentido más positivo del desafío, que no es un desafío solitario y esa me alegre mucho. Muchas y muchos hay con inquietudes, deseos y esfuerzos similares. Para avanzar mis propios procesos de renovación me tenía que ir, pero al volver he podido reconocer que cada cual vive sus propias experiencias, sus pausas, sus caminos, según como les era necesario. La gente aquí en Mexico durante ese tiempo ha vivido sus propios procesos. Hablando con pastores y líderes laicos aquí, me encuentro también con quienes me comparten que quisiera capacitarse de manera continua. Me hablan de sus esfuerzos a abordar temas desafiantes como la doctrina, nuevos conceptos teologicos , la Biblia y la manera de ver a Dios. Entonces es un desafio que me da gusto finalemente, que no vengo con la intención de abrir una puerta totalemente desconocida, que la gente a mi alrededor está a la puerta conmigo y entonces miro esta puerta y este desafío con mayor claridad. En un retiro espiritual en Puerto Rico me imaginé el desafío desde el punto de vista de la parábola en la que el reino de los cielos es semejante a una mujer que tomo un poco de levadura y la metió en una medida de masa y aparentemente no pasó nada pero tras la noche y sin que ella se diera cuenta toda la masa está leuda. Pensando en esta mujer, consideraba la necesidad de adquirir levadura de calidad. Quiero compartir esta levadura, quiero enseñar cosas de calidad, compartir experiencias de calidad que leuden correctamente la masa. Dónde ves un avance en las Iglesias actualmente en Mexico? Dónde hay una vista del reino de Dios dentro de las Iglesias hoy? Bueno, veo una apertura intergeneracional en las Iglesias hoy. Una esta dispuesta a ceder y a diologar con la otra. He visto hermosas muestras de cambio, de avance, de mejora cuando la juventud se pone en actitud de saber que tiene voz, que tiene ideas, que puede aportar y la adultez dice “te quiero escuchar y voy a trabajar contigo”. Cuando he visitado congregaciones en que han permitido este dialogo y no solamente eso, sino el acompañamiento también, que la juventud se siente reconocida, respaldada por la amplia experiencia de la adultez, y esta no se siente intimidada o desplazada, allí se abrireron oportunidades y las Iglesias caminan. Cuando las generaciones se escuchan ente ellas las estructuras llegan a ser menos importantes que las personas. Y Lisania, hay otra área de la obra en que puedas añadir tu levadura? Si, me interesa involucrarme en eventos de educación continua. Me interesa compartir lo que he aprendido y lo que estoy en proceso de aprender y me interesa mucho dirigirme hacia las mujeres por causa de la sociedad Mexicana que tiene un matiz machista y roles de genero rígidamente establecidos, y por la manera en que la Biblia ha sido usada para reforzar eso. Siento esa responsabilidad fuerte de invitar a foro, a discusión, de qué manera podemos evitar el uso de la Biblia para mantener estructuras opresivas. En la actualidad somos tres pastoras ordenadas en México, por parte de Discípulos de Cristo, aunque obviamente muchas más mujeres están ejerciendo esta labor sin dicho reconocimiento o respaldo. Sé que podemos cambiar esa realidad. En fin, no creo que este matiz de machismo es por gusto de los hombres. Yo veo que el machismo nos hace daño a ambos, a los hombres y a las mujeres. Por que debe ser extremamente cansado que siempre deban tener la razón, estar siempre controlando el todo, no poder expresar su fragilidad o que están cansados. El machismo me parece altamente opresivo para los hombres.